Stay up to date with the latest news regarding Datamax, our Alliance Partners and the Business Technology industry. Coppell, TX, June 15, 2018 — The first iPhone was released in the United States in June 2007. That same year, Datamax began its unprecedented streak of earning one of Canon’s most prestigious accolades. 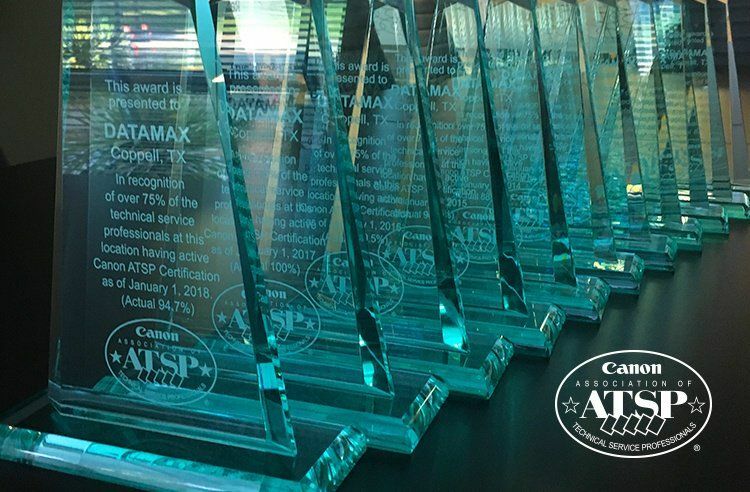 Datamax Texas achieved the Association of Technical Service Professionals (ATSP) National Service Recognition Award for the 11th consecutive year from Canon U.S.A. Inc., the only dealership in the United States to do so. This decade-plus long streak confirms Datamax’s elite technical support expertise and customer service performance, along with its commitment to top-level training for its technicians.